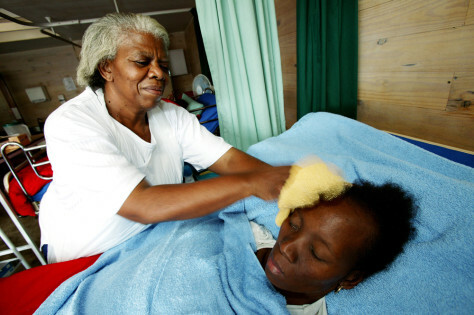 A hospice caregiver sponges off a woman's forehead in the Vereening District in the Gauteng Province of South Africa at an HIV clinic. On Monday, researchers announced disappointing results for an anti-AIDS gel aimed at helping women protect themselves from the virus. The trial, conducted with thousands of South African women, is a the latest challenge in microbicide research.